Jeff is checking in with a look at one of last year's Hot Toys releases, and one of my favorites. I checked it out here, and now Jeff weighs in with his thoughts - take it away, Jeff! A big thank you as always to Michael for keeping this place so vital. Recently it has been noted that Hot Toys have significantly upped their game. Not just in terms of the quality (which is already showcasing the state of this particular art), but also in the quantity of product released. As their status has grown internationally in the field of collectibles they have had to step up the timeframe in which they release the figures from any given license in order to keep the delivery date as topical and relevant as possible (OK, OK I know we are still waiting for some good pics on the Avatar figures, but I think the unique nature of the N’avi physiology has bought them a little time there). However, what I’m trying to say is that for serious collectors the gap between the release of figures is getting ever closer together, meaning that many people are forced to make painful decisions on what they must have, and what they can (hopefully) put off for a little while, without fear (perhaps even more hopefully) of the secondary market making the price sky-rocket to an unobtainable level. It also means that as a reviewer it is often hard to keep up with the deluge that keeps up its relentless flow. We all try to keep our reviews as relevant as possible, but selections are inevitably made. And so I decided to live with my T1000 for a while. After all Mike managed to get his review onto the (virtual) news stands so quickly that I thought it would be almost irrelevant to rush mine out too fast on its heels. 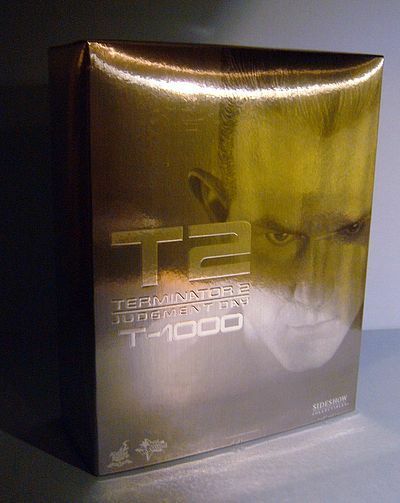 But at the same time, there is absolutely no getting away from the fact that the T1000 set yet another benchmark. But again not just in terms of quality, but on this occasion also of quantity. 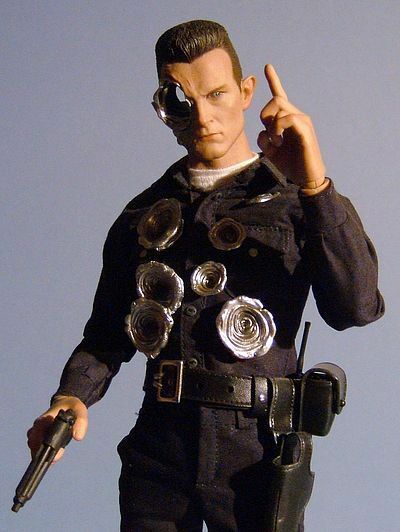 Quite frankly the T1000 is a DX figure in every sense of the word apart from the lack of the cool PERS feature. What we get is almost … with the emphasis on ‘almost’, two outfits, two head sculpts and ton of accessories. 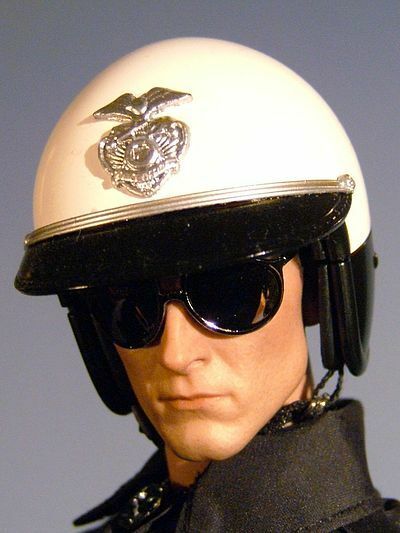 But enough pontificating about the actual figure, why was this particular character given so much attention, and what makes him so important within the Terminator franchise/universe anyway? Well, I’ve never made my favour of the original movie a secret; it was and is a classic. Yes I admit it’s dated in many ways, but it is also a classic of modern cinema, regardless of genre… sadly the same can’t be said of the rest of Mr Cameron’s back catalogue… successful… yes! But classic…. I don’t think so! His raison d'�tre always seems to be putting bums on seats rather than getting the chin strokers to stroke their chins, and that’s not such a bad thing, as we all need to be entertained and movies like T2 and Avatar are hugely entertaining, to the point that I have watched both numerous times. So although not stroking my chin, I do find myself marvelling at the way Cameron has honed his craft at doing what he does so well. However with T2 we also had huge amounts of money thrown at the screen, and after the poor show of the Abyss it was arguable as to whether Cameron was up to the job… but by Darwin he was! Although showier and brasher than the original Terminator movie, it also brought the very real notion of a future society (threatened by the technology it was creating) very much to life, and to a far larger audience than its seminal predecessor. 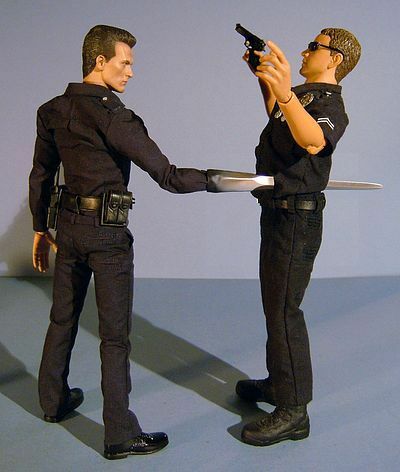 So the T1000 was an important part of that threat. It forced the audience to take an even bigger leap of faith than they did in the original movie. After all we have all grown up with the idea of hulking mechanical robots, and we have also (in our mass imaginings) thought of them as larger than life and powerful machines… hence the Arnie inspired T800 (although as a side note Cameron’s original idea was to cast Arnie as Sarah Connors human protector, while an actor of more regular proportions was to have been the relentless mechanical assassin, able to throw a man twice his size around like a rag doll). However that juxtapositioned concept didn’t come to fruition till the second Terminator movie, and for that we must all give thanks to James Cameron. After all, not only did he manage to make ‘THE Terminator’ the hero, he also managed to redefine the standard of digital special effects and he gave us a story, that though no longer original, was certainly engaging and well put together with production standards that still remain second to none (for its time). 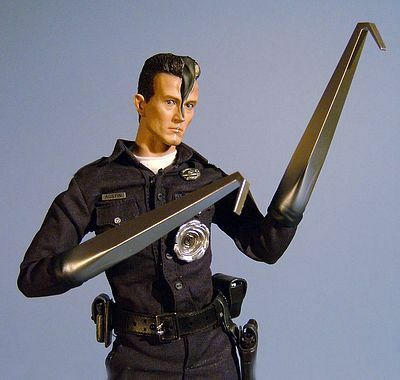 But on this occasion the big bad came in the form of the T1000 model of Terminator, a prototype shape shifting model that can morph itself into liquid metal and after contact with a subject it can faultlessly mimic the victim from his/her voice right down to the pattern on their clothing. He also proved to have an even steelier resolve in completing his mission, and but for luck, circumstance and location would almost certainly have been successful in his mission of not only terminating John Connor, but also his mother Sarah. 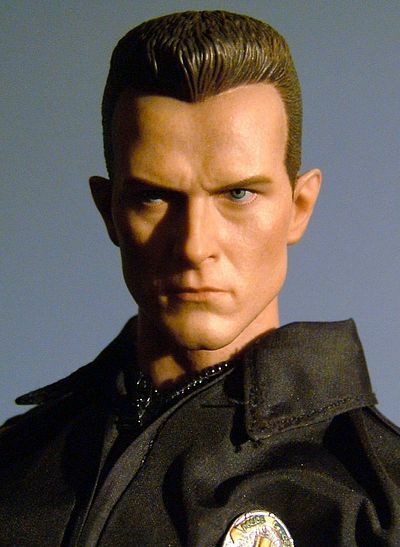 So with the T800 from the original ‘The Terminator’ recently released, I decided it was time to finally take a long look at the T1000, and it’s plain to see why he’s such a fan favourite. I’ve all ready spelled out that I am not too enamoured with this line of packaging. There is nothing ‘per se’ wrong with it, but it just lacks the wow factor and any kind of dramatic impetus to make it memorable in the long term. However, I know plenty of folks who do like these boxes, and lets face it there is nothing actually wrong with them… I just personally find them a little dull, especially when you consider the subject matter. So once again we get a slip over outer sleeve with a closed top, this has monochrome images of the figure. 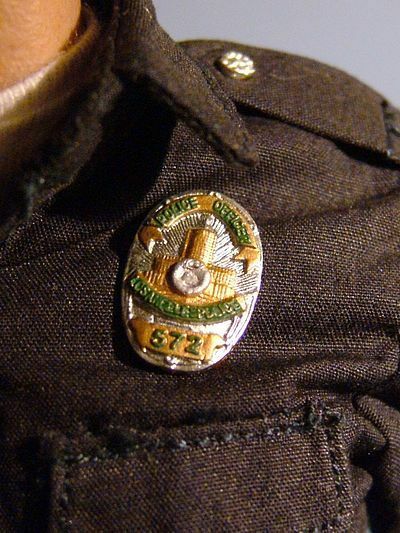 The inner box has a large window on the front and production credit on its back, then inside the box you’ll find the fully dressed (in the regular cop outfit) figure alongside his ‘oh so numerous’ accessories. So a nicely constructed and well put together bit of packaging, but sadly it’s still one that fails to inspire me. In this set you get two very impressive heads, the regular ‘normal’ one and the split down the middle version, and if you were lucky enough to have scored the T1000 Sarah Connor disguise that I reviewed here then you will also have the doughnut head. Before I get into the nitty-gritty of this set I thought I’d just give my quick assessment of the three heads available. For me the regular head is without a doubt the strongest, the quality of the portrait is up there with the best, next is the doughnut head and I have to say it’s the one I would have preferred to have seen packed as standard with the T1000 as it shows some great observations on both the human side and the damaged bullet hole area as well, which means for me the split head ends up following up the rear. It’s still a great piece of work, and obviously works well in conjunction with the ‘jemmy’ arms, but the doughnut head is more iconic, and I feel the split head could have been more exaggerated, showing the damage when it was more extreme. So, that’s my order of preference, it may not be yours, but hey that’s what reviews are about. Opinions… not facts! 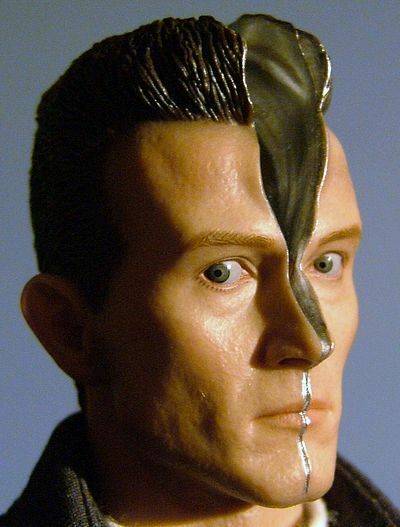 The normal head is perfect for representing the T1000 in many poses, as it captures the fixed menacing stare but with a slightly impassive ‘removed’ other-worldly look that Robert Patrick sports during the major part of the movie so well. It’s the work of Young Tae Jeon, who I have to admit is a new name to me, but I have a strong feeling it won’t stay that way for long (he also worked on Hans Landa and the cool Sam Flynn on Lightcycle). His work continues the outstanding levels set by the likes of Yulli Choi and KoJun by giving not just phenomenal portraiture but also superfine observations on skin texturing and hair. The work on the faces accurately translates Patrick’s lean angular features on both heads whilst also showing some nicely observed detail on the hair style. The gash down the middle of the split head (though not my fave) is expertly rendered, and the transition from flesh to liquid metal is well carried out texturally, aided even further by the expert paint app that I’ll cover in the next section. 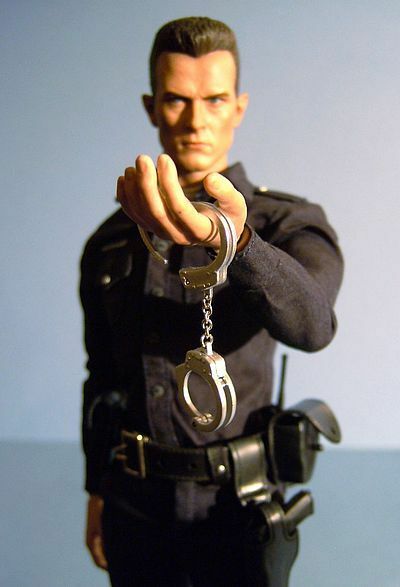 He also comes equipped with a fine selection of hands to suit key poses and moments from the movie, but more on this in the accessories section. It’s worth pointing out they are all finely carried out and swapped over easily. Although not quite up there with the T800, I think it’s still safe to say this was a very much anticipated figure, and as such we could guarantee it was going to be getting an fantastic paint job to match its popular status. However, as we all know, it would more unusual these days for a figure to get anything less than an outstanding paint job from Hot Toys. So we get the usual fabulous warm flesh tones that enhance and elevate the cool work carried out on the skin texturing of the sculpt and of course the spookily life like glossy eyes that JC Hong has made his own. The hair is a dark brown that allows the tight work on the sculpt to shine through and the metallic silver used on the exposed cut through the head is also a good dense solid colour with the transition between the flesh and metal being clean and crisp. Many of the accessories also have painted elements, but I’ll cover that in the relevant section. So, to sum up, we have another spectacular paint job, but not just on one head, here we get twice the value! As I said above, in many ways this is almost a DX figure, and one of the areas that really stands out is the outfit. 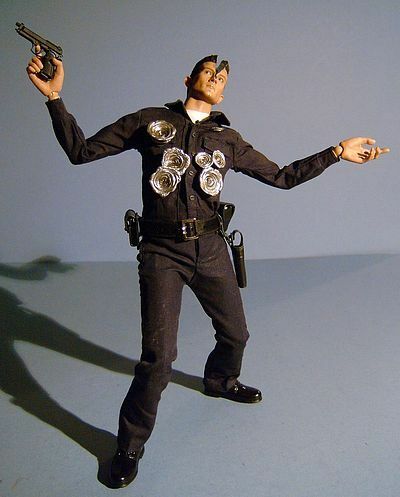 He comes with a complete LAPD beat cop outfit, consisting of a white T-shirt, blue open collar patch pocket shirt with badges and epaulets, matching blue trousers with working pockets and belt loops. 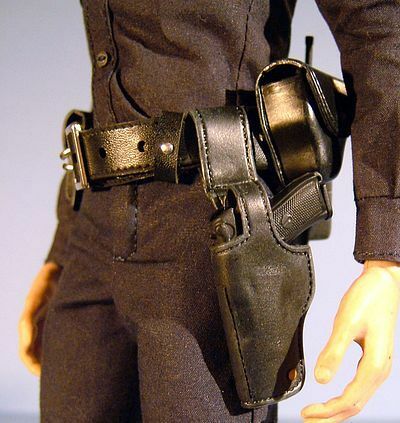 Over these he wears his utility belt that holds his holster and pouches for his radio, cuffs, spare magazines and a ring for his night stick. On his feet he wears a pair of shiny black dress shoes with black sock tops. Then we get the second outfit, and to make best use of all the extras it’s most definitely worth getting hold of a second slim True-Type if you can, as once you have one you have the ability to construct a complete second figure. Admittedly a second T-shirt, shirt and utility belt would make it even more complete, but even without these parts you can make a solid display piece. I shall take my photos without using the shirts twice to demonstrate how by simply zipping the jacket up completely you can circumnavigate the need for those extra garments. 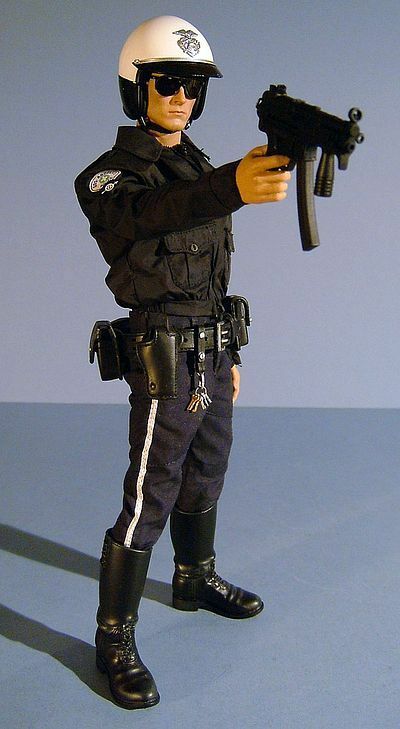 I also have an old Elite Force BBi LAPD figure, so I’ll borrow the belt from him. You can still pick up the BBi figures quite cheaply sometimes and all the accessories are metal, so I can highly recommend them if the actual HT versions get too expensive (or elusive). 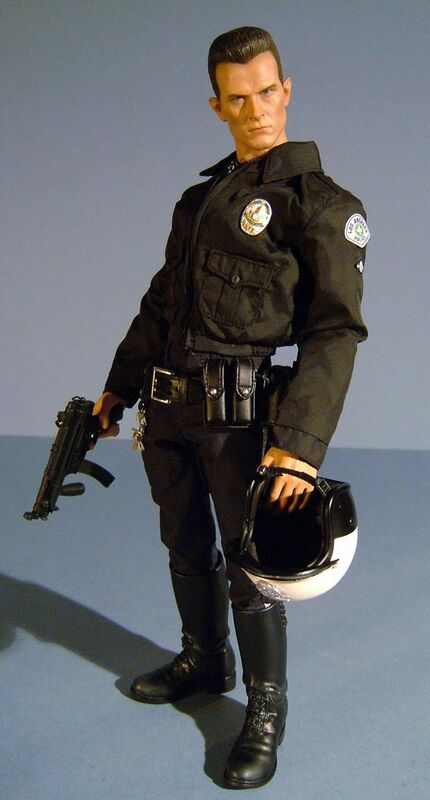 The actual garments we get for the second bike cop outfit consists of high riding boots, blue trousers with working pockets and white piping up the outer seam, a black ‘wind breaker’ blouson with front pockets and all the relevant patches and badges. Then lastly there’s the helmet and shades. The helmet pulls apart along the seam where the black part meets the white, so just remove the ‘regular head’ slip on the shades and slot the lower part into position with the strap under the chin, then just slot the top part on and clip into place. To remove the helmet again I discovered that slotting a thin blunt blade into the seam of the helmet and prising it gently apart makes the job much easier (thanks for the pointer there Sean). All the relevant parts are tailored to the usual lofty standards that Hot Toys have set, and the fact we get two outfits makes this category an easy home run, pure class! 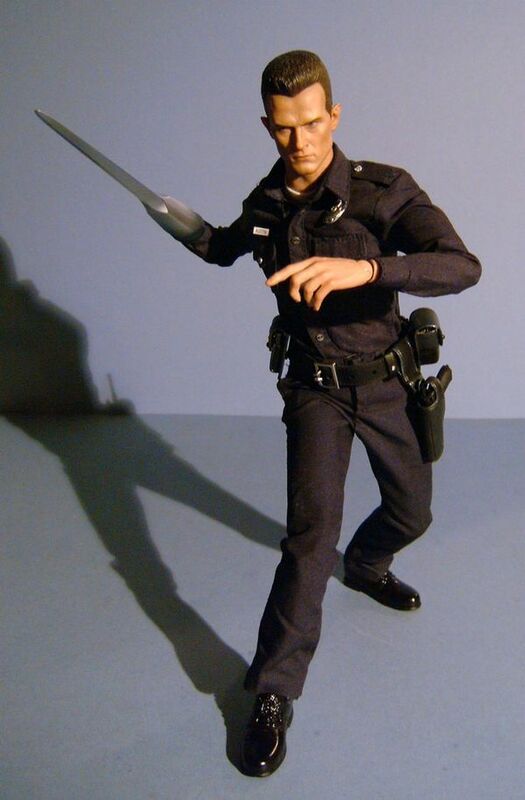 Under the clothes the T1000 is supported by the classic slim True Type that I covered here, and it still manages to keep its grip on that elusive top slot in terms of a well put together and supremely poseable base body. It can hang well and look natural, even when posed by rank amateurs. This version has the addition of metal plates stuck to the chest and abdominal areas, this is to give a surface for the magnetic ‘liquid metal’ bullet wounds to grip on to, You can see them in Mikes review here. It poses as well as we have all come to expect and the outfit doesn’t restrict mobility at all, well, apart from on the ankles for the motorcycle cop boots, but all in all this category is just about as close to perfect as you could wish for. Well I said the outfit category was amazing, and so is this! Impressive? Oh I think so! I’ve been over many of the items in other categories above, but suffice to say all the bits that make up the haul here are well designed and thought through with some innovative design solutions on things like the ‘opening’ cop helmet and magnetic bullet wounds. The hand selection is specific and pertinent to this character, with the pointing… well, to be honest ‘wagging’ finger hand giving the figure a lot of attitude when posed. 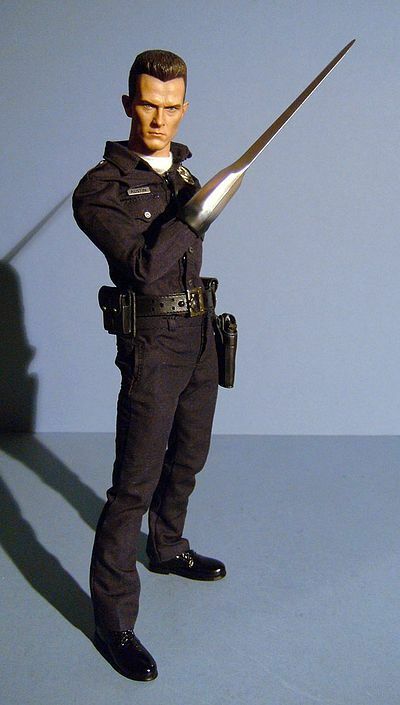 The metal effect blade and jemmy arms are well constructed too and swap over reasonably easily and are again included to help recreate key scenes from the movie. 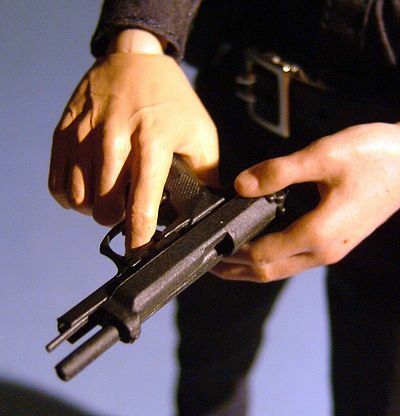 Both the guns have articulated elements with removable magazines and the handcuffs work as well. Lastly we get the classic black figure stand, but the figure stands just fine without it anyway. A great selection, whichever way you look at it. 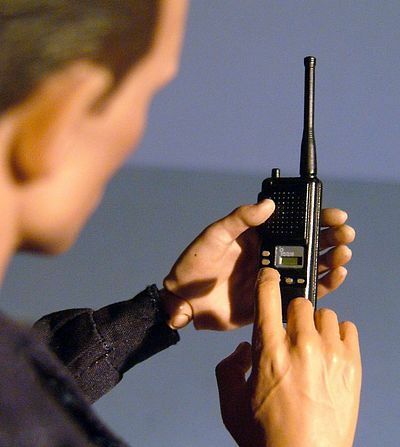 If you had to have any companion piece to stand next to your T800 then this is the one that I’m sure 9 out of 10 T2 fans would probably go for, and it’s easy to see why. 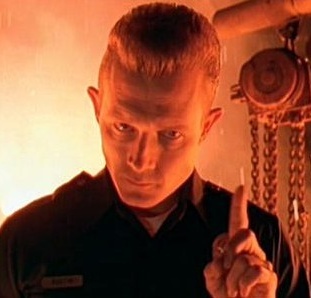 The T1000 was a character with a ton of screen presence, and though he didn’t manage to actually steal the movie from Arnie, he still left an indelible mark on the canon of cinematic big bads! And with the huge amount of goodies we get thrown in here you can just about recreate all the classic looks and poses we saw in the movie, hell, if you had the inclination you could even dip him in liquid nitrogen for the memorable ‘frozen solid’ look. So if you want the best 1/6th representation out there, as of right now, this has got to be it! How could this set get anything less than a full score? Yes I know it’s expensive, but just look at the haul! The full RRP is $164.99, but by using the links below you can get him for as little as $150, which is what I’m basing my score on. And I bet if you’d decided to sell off the bits you don’t use (not likely I know) but I bet you’d make a damn good return on your outlay. 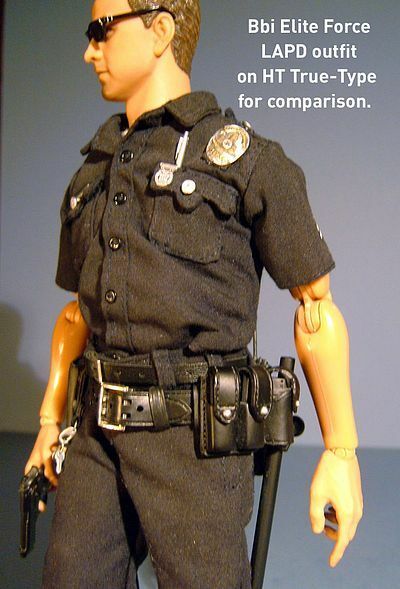 And when you compare like for like against his companion the T800 or even other recent figures like Perseus or Barney Ross (both in the same price category… or more), then even the price seems a lot fairer. So this guy gets an honorary mention in despatches… with the Purple Heart thrown in for good measure. You can just tell that Hot Toys wanted to do the Terminator licence justice, and they certainly have! This guy has quality just seeping out of every plastic pore. This is the kind of figure that reminds you why you love and collect this scale… or the kind of figure that convinces you that you should love and collect this scale! Virtual perfection… nothing else to say! 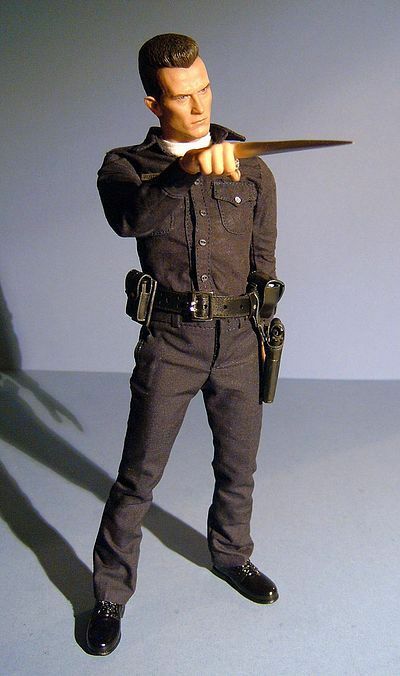 Sideshow did have a second batch still in stock at the time of writing, but I don’t think they’ll be around for long. Or you can try eBay, where ‘buy it now’ prices ranges from $150 to $175.